ONLY over half of Ireland’s advertisers are mobile ready, new figures show. A new study found 56pc of firms have mobile optimised sites, over the EU average of 54pc but well behind the UK where 64pc have devised apps or specialised sites for mobile phone users. 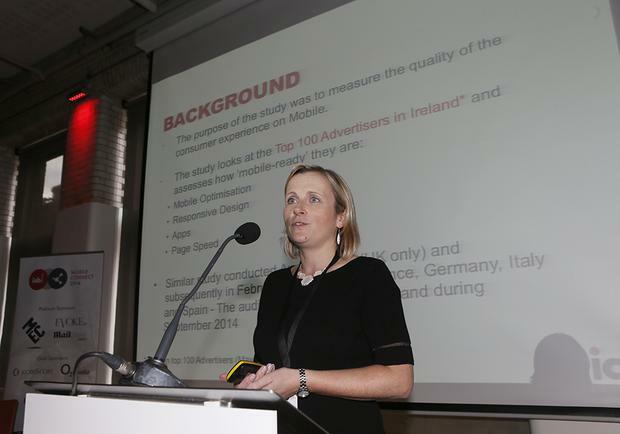 The results of IAB Ireland’s first mobile audit of Irish advertisers were released at the IAB Mobile Connect conference. Maeve O’Meara, marketing managing with IAB Ireland, warned consumers are unforgiving if an app or site is not consumer friendly. “They won’t stay on a website if the experience is bad,” she said. “Google’s consumer barometer, just released this month showed that if issues are encountered while accessing websites via a smartphone, 25pc will find another site that works better rather than trying on another device,” she said. More than six out of ten have iphone apps and ipad apps, 58pc have developed a Google play phone app and 53pc a Google play tablet app. Looking across the different industry sectors, entertainment and media scores the highest with 85pc having apps across all devices, followed closely by auto at 78pc. Elsewhere, 24pc of websites featured ‘responsive design’ sites – making viewing easier for the user - compared to the EU average of 15pc. With 65pc of Irish consumers using their smartphone to go online, and almost four out of ten of using a tablet, mobile is mandatory for brands to reach consumers, who have high expectations. Ms O’Meara said it is great to see Ireland score higher than the EU average on some of the key mobile optimisation metrics.